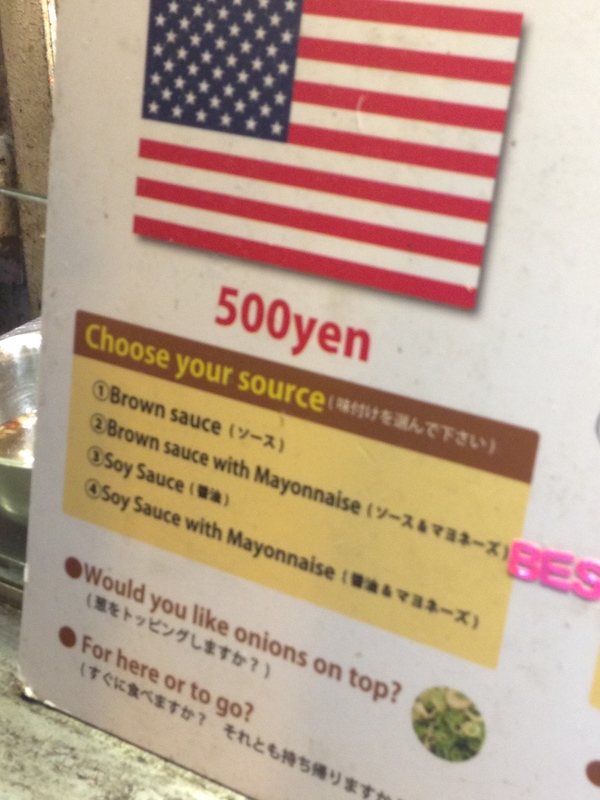 I’m not a huge fan of Japanese food. My palate is much more attuned to the more robust flavours of their Indian, Thai, Indonesian and Malaysian neighbours. I recognise and appreciate the Japanese approach to food, their clean palate, their appreciation of texture, their focus on impeccable presentation, but it’s never my first choice when eating out. So how does a woman last twelve days in Japan and what does she eat? Last time we spent time in this wonderful country I ate a lot of deep fried chicken curry don from the ubiquitous Yoshinoya, and bought some chilli sauce to season my food. This time around we ate a lot of street/casual food, probably because we spend quite a lot of time in Osaka, the city that loves to eat. Osakans are known by their Japanese neighbours as the people who will eat until they drop (apparently Osakans will bankrupt themselves for food, whilst those in Kyoto will bankrupt themselves for fashion). 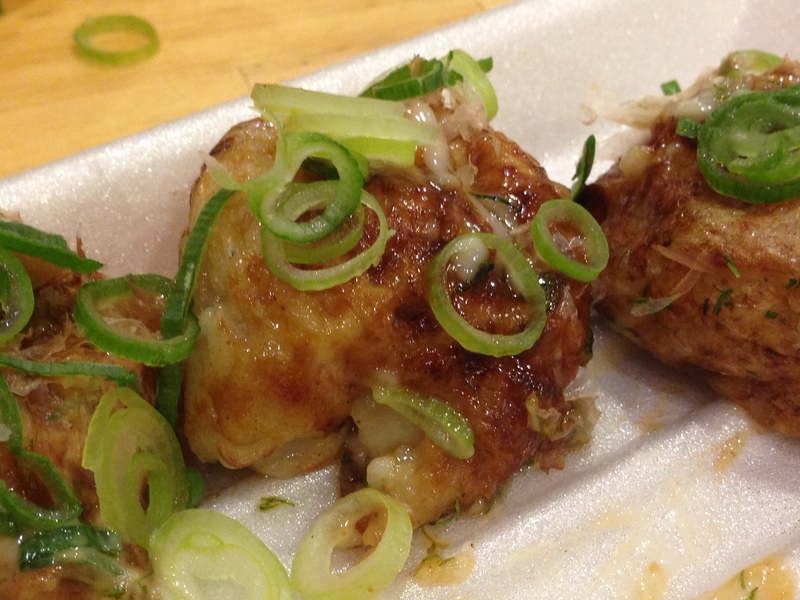 Osaka loves takoyaki, a cheap street food otherwise known as octopus balls. 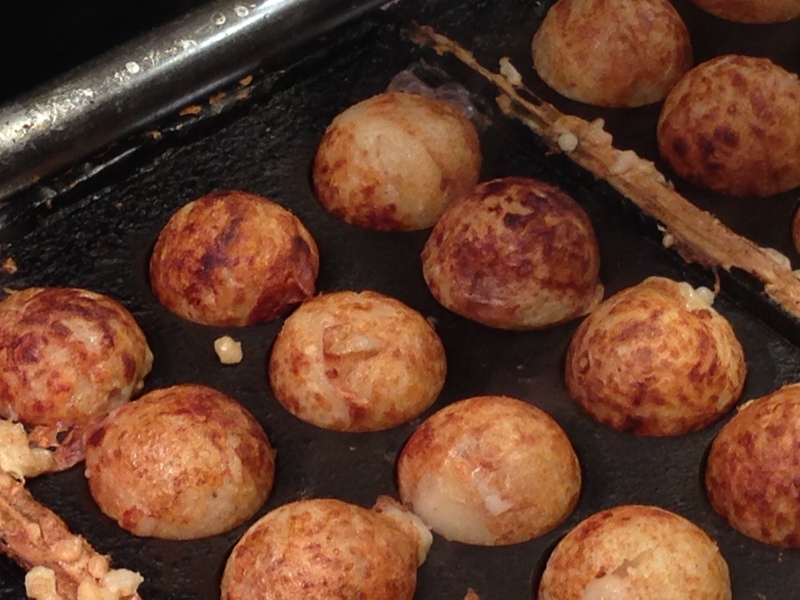 They are cooked in what looks like a poffertje pan. 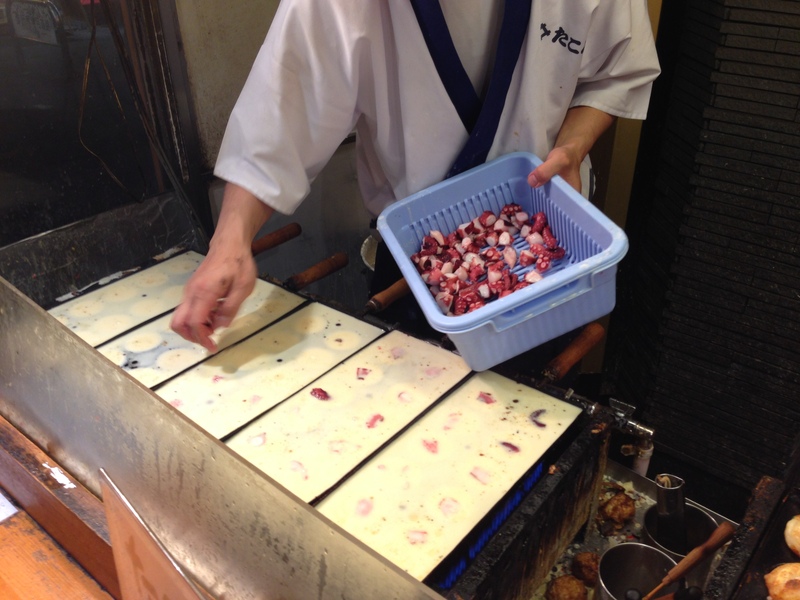 The cook throws a small chunk of octopus into each circular depression and adds a pancake-type mix in on top. Most sprinkle in tempura scraps (which frankly look like Rice Krispies to me) and some spring onion and/or pickled ginger. 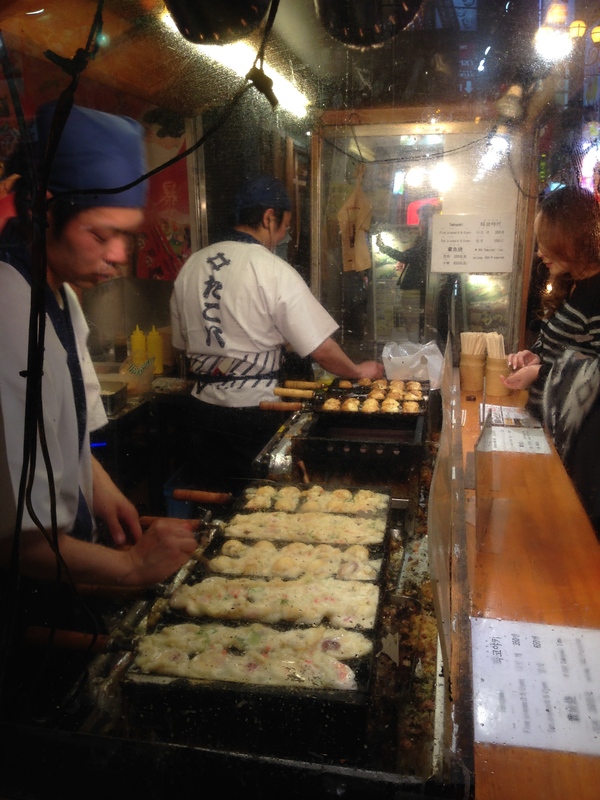 The takoyaki-wrangler uses a long bamboo skewer to coax the mixture into perfect spheres, as the queue grows longer and longer. 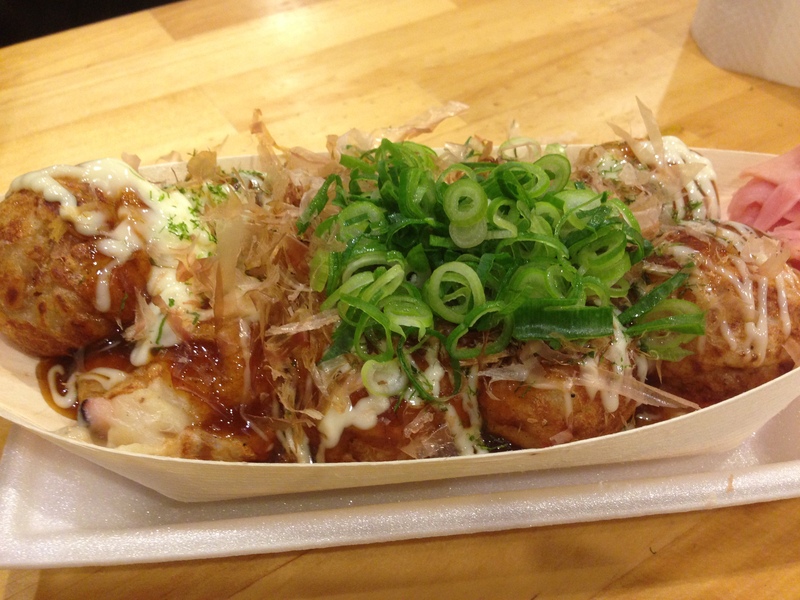 They are served in a polystyrene container or bamboo boat, brushed with a brown worcester sauce mixture, squirted with Japanese mayonnaise and sprinkled with aonori, a type of ground-up seaweed. The final flourish is a generous handful of shaved bonito fish, which melts onto the top. Some vendors also offer chopped spring onion which is delicious. They are messier to eat than you’d think: each ball is still quite liquid in the middle, so the trick is to wait a few minutes before you eat the first one otherwise you will burn the roof of your mouth. 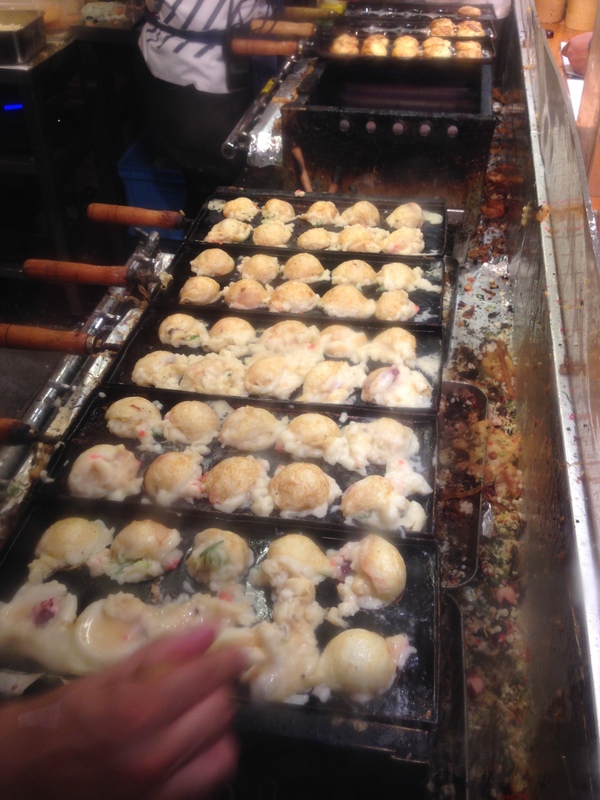 Everybody has their favourite vendor to go to, but head to Dotombori in Osaka and join the end of the longest queue and you won’t be disappointed.